Tin chemistry retains a place in contemporary science as an important element owing to its wide range of applications. New and exciting research is being generated on an annual basis from all parts of the world – the study of tin and its compounds attracts considerable interest from a range of perspectives such as organic synthesis, medicine, materials chemistry, catalysis and environment. 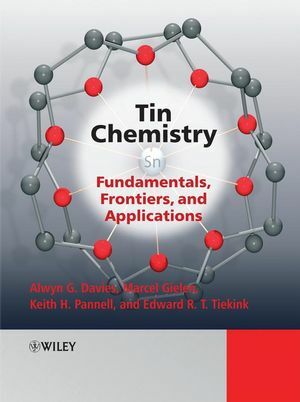 Tin Chemistry – Fundamentals, Frontiers and Applications is an essential overview of modern perspectives on this important element for the specialist and non-specialist alike. It will promote cross-disciplinary interactions and at the same time be an essential teaching resource for advanced university classes. Professor Davies is the author of Organotin Chemistry (Wiley-VCH, 2nd Edition 2004) and editor-in-chief of Journal of Chemical Research and Science Reviews. Professor Pannell has published over 200 articles in the international literature in the general area of main group chemistry. Professor Tiekink serves as co/associate editor for Acta Crystallographica E, Applied Organometallic Chemistry, Bioinorganic Chemistry & Applications, and Zeitschrift fur Kristallographie. 1. Introduction and overview (A. G. Davies). 2. Fundamentals in tin chemistry. 2.1 NMR of tin compounds (Bernd Wrackmeyer). 2.2 Sn(II) clusters (Tris Chivers and Dana Eisler). 2.3 Monorganotin oxo-clusters (François Ribot). 2.4 Organotin carboxylate and -sulfonate clusters (Vadapalli Chand Rasekhar). 2.5 Macrocyclic and supramolecular chemistry of organotin compounds (Herbert Höpfl). 2.6 Tin Zintl Ions: Synthesis, Structures, and Reactivity (Slavi Sevov). 2.7 Stable stannyl cations in condensed phase (Joe Lambert). 2.8 Preparation and coordination chemistry of mono- and bidentate stannylenes (Alexander V. Zabula and F. Ekkehardt Hahn). 2.9 Stannenes, distannenes and stannynes (Norihiro Tokitoh and Yoshiyuki Mizuhata). 2.11 Unusual bonds and coordination geometries (Raymundo Cea-Olivares). 2.12 Tin(II) heterobimetallic and oligometallic derivatives (Muhammad Mazhar). 2.13 Computational Methods for Organotin Compounds (Sarah Whittleton, Russell J. Boyd, and T. Bruce Grindley). 3. Materials Chemistry and Structural Chemistry of tin compounds. 3.1 Tin compounds for CVD (Geraldo Lima). 3.2 Class II Tin-Based Hybrid Materials Prepared From Alkynyltin Precursors (Thierry Toupance). 3.3 Organotin compounds as PVC stabilizers (Esen Arkis). 3.4 Organotin compounds as anion-selective carriers in chemical sensors (Nikos Chaniotakis). 3.5 Tin compounds as flame retardants and smoke suppressants (Paul Cusack). 3.6 Quadratic nonlinear optical properties in tin-based compounds (Pascal G. Lacroix). 3.7 Tin-based hybrid materials (Bernard Jousseaume). 3.8 Organotin polymers and related materials (Keith Pannell and Sharma). 3.9 Intermolecular tin…π-aryl interactions: fact or artifact*? A new bonding motif for supramolecular self-assembly in organotin compounds (Ionel Haiduc, Edward Tiekink and Julio Zukerman-Schpector). 4. Medicinal/Biocidal Applications of tin compounds and Environmental Aspects. 4.1 The cardiovascular activity of organotin compounds (Mala Nath). 4.2 Organotins: Insecticidal and larvicidal activity (George Eng and Xueqing Song). 4.3 Antifungal activity of organotin compounds (Heloisa Beraldo and Geraldo M. de Lima). 4.4 Chemical and biotechnological developments in organotin cancer chemotherapy (Claudio Pettinariÿ and Fabio Marchetti). 4.5 Impact of organotin compounds on the function of human natural killer cells (Margaret M. Whalen). 4.6 Biological aspects of organotins: perspective in structural and molecular biology (Norberto Farfán, Hiram Beltran and Rosa Santillan). 5. Tin in Organic Synthesis. 5.1 Applications of Organotin Derivatives for Carbohydrate Synthesis (T. Bruce Grindley). 5.2 Reactions of SE? Substitution for Organostannanes in Organic Synthesis (David R. Williams and Partha P. Nag). 5.3 Organotin compounds for Carbon-Carbon Cross-Coupling (Pablo Espinet and Miroslav Genov). 5.4 Cross-Coupling of Organotin compounds for Carbon-Carbon Bond Formation: Applications in Total Synthesis (Antonio Echavarren). 5.5 New Trends in the Synthesis of Solid-Supported Organotin Reagents and Interest of their Use in Organic Synthesis in a Concept of Green Chemistry (Jean-Mathieu Chrétien, Jeremy D. Kilburn, Françoise Zammattio, Erwan Le Grognec and Jean-Paul Quintard). 5.6 Palladium Catalysed Cascade Cyclisation-Anion Capture Processes Employing Pre- and In Situ-Formed Organostannanes (Ronald Grigg and V. Sridharan). 5.7 Carbostannylations of carbon-carbon unsaturated bonds (Eiji Shirakawa). 5.8 Green Organostannane Chemistry: an Oxymoron (David Young)? 6.1 Green organotin catalysts (Junzo Otera, Monique Biesemans, Vanja Pinoie, Kevin Poelmans and Rudolph Willem). 6.2 Organotin catalysts for isocyanate reactions (Werner J. Blank and Edward T. Hessell). 6.3 Catalysis of reactions of allyltin compounds and organotin phenoxides by lithium perchlorate (Wojciech J. Kinart and Cezary M. Kinart).